Scientists report finding a lunar hole that might make a good candidate for a moon colony. Lava tubes have been found before, but this one is protected by "lava sheet"
(CNN) -- Building a home near a moon crater or a lunar sea may sound nice, but moon colonists might have a much better chance of survival if they just lived in a hole. That's the message sent by an international team of scientists who say they've discovered a protected lunar "lava tube" -- a deep, giant hole -- that might be well suited for a moon colony or a lunar base. 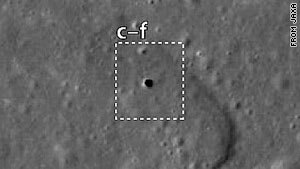 The vertical hole, in the volcanic Marius Hills region on the moon's near side, is 213 feet wide and is estimated to be more than 260 feet deep, according to findings published in Geophysical Research Letters, a journal of the American Geophysical Union. "Any intact lava tube could serve as a shelter from the severe environment of the lunar surface, with its meteorite impacts, high-energy UV radiation and energetic particles, and extreme diurnal temperature variations." Lava tubes have previously been discovered on the moon, but the scientists say the new hole is notable because of its lava shield and because it does not appear to be prone to collapse. Lave tubes exist on Earth and also have been found on Mars. The cylinder-shaped caverns can be carved out by lava flows, volcanic eruptions, seismic activity or ground collapse resulting from meteoroid strikes. The scientists used high-resolution images from a Japanese moon orbiter called SELENE to discover this lunar lava tube. The findings were published November 12, but they grabbed the attention of the public this week. NASA is reportedly working on plans to return to the moon by 2020 and to set up a temporary lunar colony by 2025 as part of the Constellation Program. Funding for the program, however, remains somewhat in question. The American space agency could not be reached for comment.